Welcome to Monu Family Guest House in Varanasi, in your service since 2004. Renovated from top to the bottom in the year 2017. 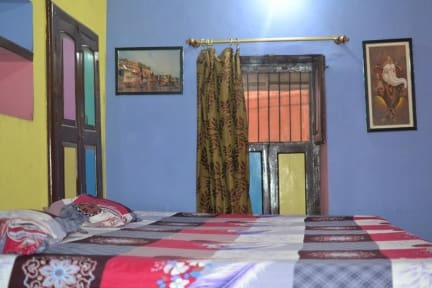 Our guest house is a family run business, located right in the epicenter of the old part of Varanasi, 5 minutes of walk from the main Ghat, the famous Dashashwamedh Ghat where the evening ceremony Ganga Aarati happens everyday at 6/ 7pm approx.We are about 2 minutes of walk from The holy River Ganges , where you can visit daily and spend most of your time on the steps of river bank . The famous ghats like Dashashwamedh Ghat, Manikarnika Ghat, and Meer Ghats are about 5 minutes of walk from our guest house. Yes, we are very close to the River Ganges. We have 4 rooms to rent, 3 double bedrooms and one single room with shared bathroom. Our double rooms have en suite private bathrooms and one dingle room has shared bathroom with both hot and cold shower, free WiFi internet in rooms and comfortable beds. Please note that we have air conditioning in rooms which cost extra charge apart from the room rent. Monu and his family runs the business who are mostly available in your service 24hrs /day. Monu himself is a licensed tourist guide approved by the government of India and is a licensed tour operator , offers various tours like Walking Tours/Boat Tour/Village Tour etc. Email him directly to make the arrangement. His wife Gunja offers cooking classes to her guests. There is a family restaurant in house where you can get breakfast, lunch or dinner according to the Menu with extra charge. Including it, we offer you free wifi internet service in rooms and around house, a free toilet paper, soap , towel, free hot and cold shower and a free city map. We offer airport pickup and drop off services for our guest. Licensed tourist guides approved by government for your safety. We don’t provide unauthorized guides as other do as its unsafe due to security reason. Please note that if you arrive before our check in time, we have luggage storage facility for guests and communal washroom where you can take shower and relax in house while your room gets ready. The same applies after you check out. You can leave your bags with us and go around the city before you leave for your train or flight. You can use our communal washroom to be freshened up before you leave. Note- That after you make a booking with us, you will get our email and phone number details through Hostelworld. Please email us directly for any changes or request you have regarding your visit to Varanasi. We will try to get back to you asap. Remember that we don’t have any other chain or branch around India so don’t be scammed. Cheers ! !